The Ramblin Trail is in the Navajo Rocks Mountain Bike Area north of Moab, Utah. The trail begins at the Wipeout Hill parking area where it descends slickrock domes and crosses sandy bottoms while paralleling a branch of North Sevenmile Canyon before ascending more slickrock and coming to an end at the parking area for the Rocky Tops Trail. 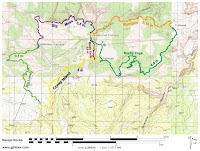 The Ramblin and Rocky Tops trails can be combined to create a route that is sometimes referred to as the Navajo Loop. The suggested direction of travel for mountain bikers is in the clockwise direction or from west to east. The Wipeout Hill trailhead is about 7.4 miles west of the junction of Highway 191 and 313 in the vicinity of mile marker 16. The Big Mesa trail also begins at the same trailhead. 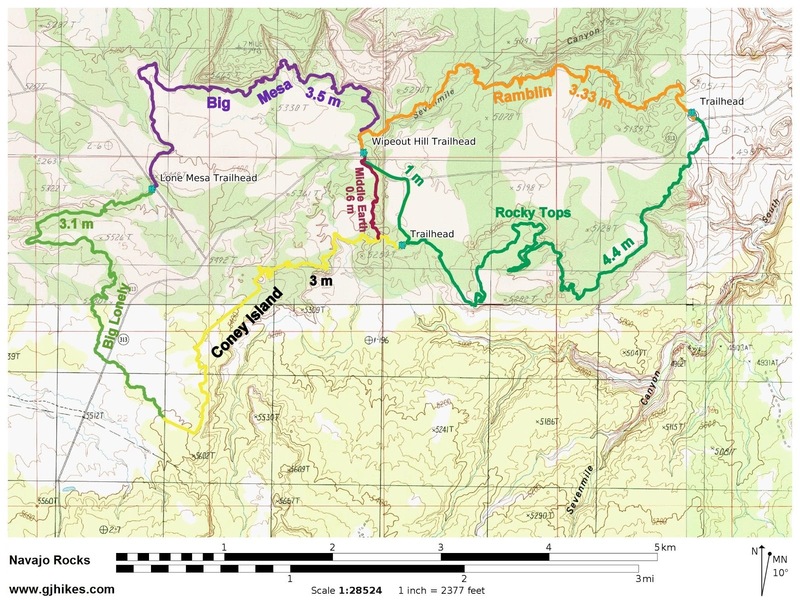 Within the first couple tenths of a mile the Big Mesa and Ramblin trails split. The Ramblin Trail follows the right branch that is marked with orange paint. The trail crosses several large expanses of slickrock connected by shallow sections of red dirt as it heads toward North Sevenmile Canyon. As the trail continues it makes several steep descents down slickrock domes and spillovers. Several 4x4 roads are crossed as the trail progresses. Uphill sections of dirt trail climb out of the various washes the trail enters. The flattest part of the trail is a half mile section that parallels the rim of the canyon. While the trail trends downhill with an average grade of 6% there are several climbing sections that regain around 50 feet of elevation each. All total there is about 490 feet of elevation gain. The last bit of climbing near the end of the trail climbs more slickrock gaining a little over 100 feet of elevation. The east end of the trail is across the highway from the beginning of the Rocky Tops trail. From here there is the option to take the Rocky Tops trail back to Wipeout Hill, follow the highway or simply turn around and return the way you came. Besides mountain biking the Ramblin Trail is also a good hike with lots of places to explore. If you would like to see it for yourself then all you have to do is grab your bike or 'Take a hike'.